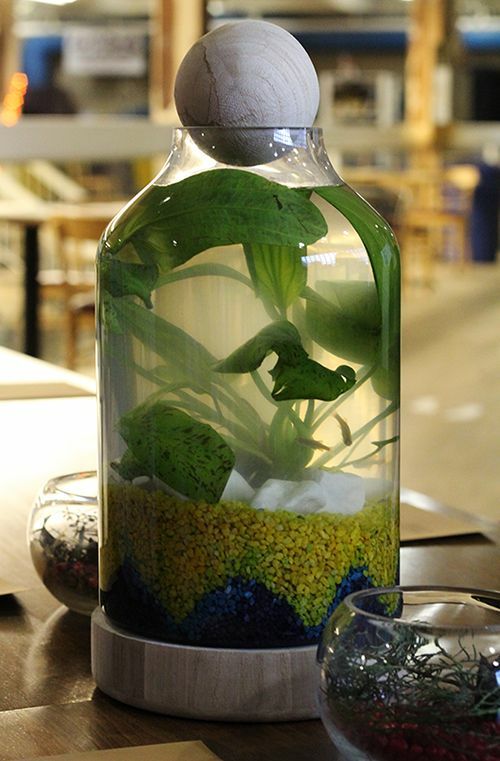 What's one of the latest food trends in Edmonton? It's starting to feel like gourmet hot dogs are becoming a new thing. Other major cities like Vancouver and Calgary have their gourmet and Asian-inspired hot dog spots, so it's time that Edmonton jumped on the wagon too. 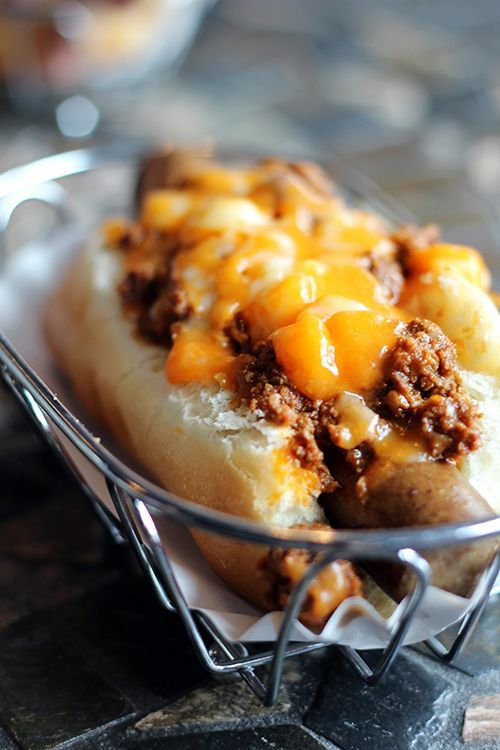 Lucky for us there's a new hot dog restaurant in the north end of the city. Having just opened up over a week ago, The Dog has taken over the spot previously occupied by Absolutely Edibles. As it turns out, The Dog is actually owned by the same people that owned Absolutely Edibles and Sloppy Hoggs Roed Hus just down the street. Sounds like Absolutely Edibles needed a refresh and a new concept to bring in more traffic to the location. Although I never visited Absolutely Edibles, I'm told that the interior has taken on quite the change. The new space is diner-esque, with metal accents, small tables and seating up at the bar. There's plenty of seating available, but also lots of space where more tables could be placed to accommodate more patrons. I was lucky to have a day off last week to catch up with Linda, Diane, Cindy, Lesley, and Addie for lunch, which meant we were able to order items to cover a large portion of the menu. The menu here is vast and there is bound to be some combination of toppings on a hot dog to suit your taste. 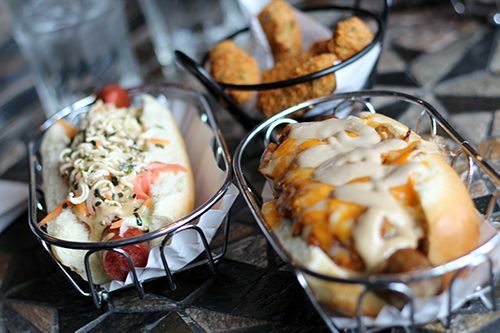 And if it doesn't, you can customize your own hot dog from a large list of toppings and different condiments. All the hot dogs are made by local Real Deal Meats, while the wild game hot dogs are made in house. 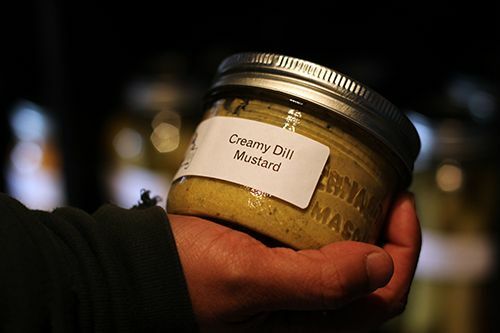 In addition to the wild hot dogs, the pickles, relishes, and mustards are made in house and the buns are baked fresh in house too. Awesome! Linda ordered some Chips & Dip ($6) to start, which was housemade potato chips served with dill pickle dip. 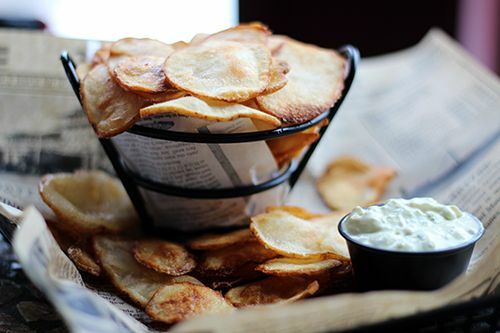 The thin sliced chips were lightly fried, with some being crisp and others still soft in the middle. I was expecting a thinner cut on the chips so that they would be completely crisp, but I didn't mind the softer texture. 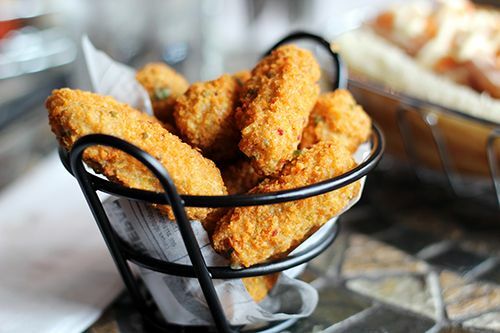 They were seasoned well with a bit of a kick and the dill pickle dip was both refreshing and flavourful. Diane ordered the Banh Mi Hot Dog ($7) which featured a beef and pork dog, head cheese, pate, mayo, cucumber slices, do chua (translated literally as sour things in Vietnamese), jalapenos, and cilantro. This was my original pick since I love a good banh mi, but she made her choice before I did. Although we had high hopes for it, the head cheese was cut quite thickly, and given that the texture was similar to the hot dog it was lost in each bite. There was little to no pate either, and the mayo was quite overpowering in flavour. We had such high hopes for this one! 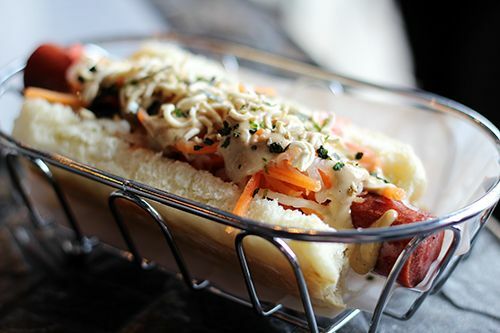 For myself I ordered the Narita Hot Dog ($7), which was wasabi mayo, kimchi, sesame sauce, do chua, pickled ginger, bonito flakes and ramen noodles on a beef and pork dog. I honestly was so skeptical about ordering it because the combination didn't sound like it would work together. But I was proven wrong and this was the favourite hot dog out of all the ones we ordered. 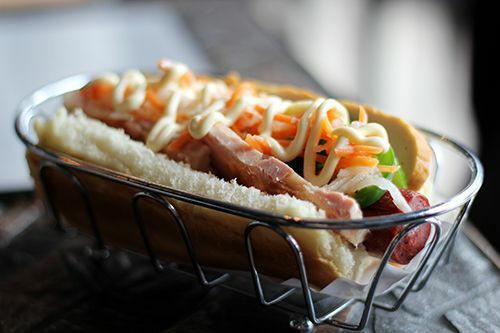 Although the kimchi and bonito flakes were practically non-existent, the sesame sauce, pickled ginger and do chua gave the hot dog a tangy, sweet flavour that balanced out the salty hot dog. The asian flavours worked really well and I enjoyed the crunch from the crushed ramen noodles. Lesley tried the Kangaroo Sausage ($12) which is made with a blend of fresh herbs. 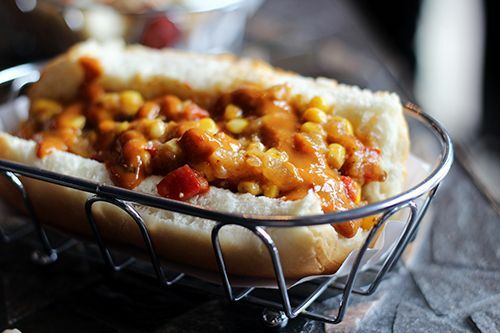 The hot dog is topped with red pepper, corn relish, and raspberry chipotle mustard. Although the hot dog itself was great, the condiments were very messy and quite tangy, masking the flavour of the kangaroo sausage. It was quite sour and definitely needed something to cut through the acidity. Linda tried the Coney Island Hot Dog ($8), made with a beef dog, beef chili, cheddar cheese, yellow mustard and diced onion. The combinations weren't too far off from your typical hot dog, so it was quite enjoyable. Look at all that cheese! The Dog definitely doesn't skimp on their toppings. Addie went for the Kansas City Hot Dog ($7) which featured sauerkraut, cheese, reuben sauce, and caraway seeds on a beef dog. 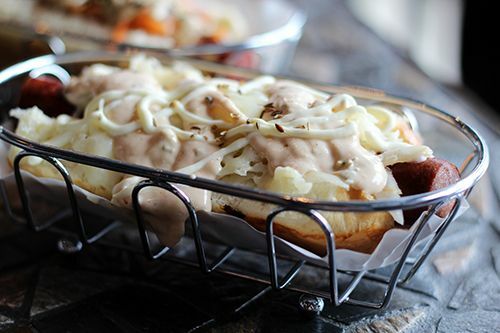 The reuben sauce was oozing out of the hot dog, so you've been warned - don't order this on a first date. The ingredients weren't overly exciting, but the combination worked well together and tasted great. 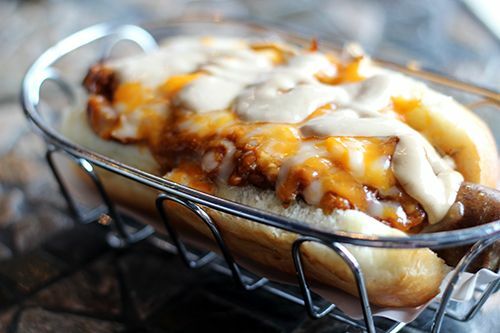 The last hot dog to the table was Cindy's Hog Dog ($8), a beef and pork hot dog with pit beans, pulled pork, shredded cheese, and waffle sauce. Like the name implies, the waffle sauce has a maple syrup flavour to it, but she was hoping for more of the sweetness to come through. Again the ingredients weren't too exciting, but there was plenty of pulled pork and cheese to make this hot dog quite substantial. For sit-down lunch, service was quick and the hot dogs were decent. Running at $7-$12 depending on your toppings, The Dog is quite affordable and a nice place to stop for a quick bite to eat if you're in that area of the city. I should also mention that they cater to vegetarian (falafel and tofurkey dogs!) and gluten free diets as well, which is really great to see at a place selling hot dogs. At the back of the restaurant there is a large shelf with a selection of condiments used on the hot dogs. From hot and spicy roasted red pepper mustard to roasted garlic chipotle corn relish, there are so many unique choices you can buy and take home. So, for gourmet hot dogs in Edmonton where should you go? IT Dog or The Dog? I actually prefer The Dog, because they are more local with their products and I found their hot dogs tasted better. IT Dog has a nice selection of Korean-style hot dogs, but I like that The Dog has hot dogs that pull inspiration from a wider range of cuisines. The price point at The Dog is on par with IT Dog, but to be fair, IT Dog serves all their hot dogs on pretzel buns while The Dog charges an additional $3 for pretzel buns. I also favour The Dog given that there is a greater ability to customize your hot dog to your liking with a wide range of toppings that aren't just Asian-inspired. 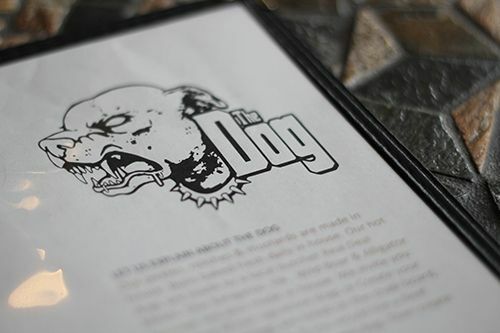 Overall I had a great experience at The Dog, so wherever you go, let your taste buds guide you! Who loves pasta? I do, and I would probably cry forever if I could never eat it again. Yeah, I love it. Maybe not as much as soup noodles, but pasta definitely ranks high on my list of favourite foods. 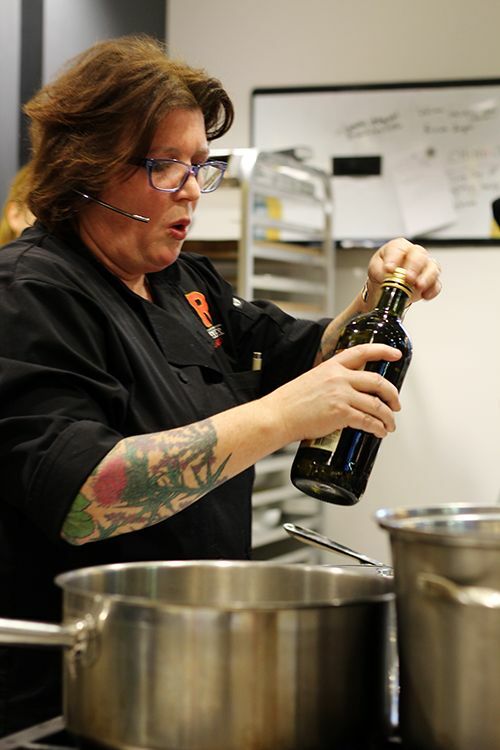 Last week I had the amazing opportunity to spend a night with Chef Lynn Crawford to learn a bit about Catelli's new line of pasta, and to cook some dishes alongside Chef Lynn. How fun! Chef Lynn Crawford is an award-nominated cookbook author, chef-owner of Toronto-based Ruby Watchco restaurant, host of the Food Network Canada’s Pitchin’ In, judge of the Food Network Canada’s Chopped Canada, and the first female Canadian invited to participate in the Food Network's Iron Chef America and Top Chef Masters Season Five. 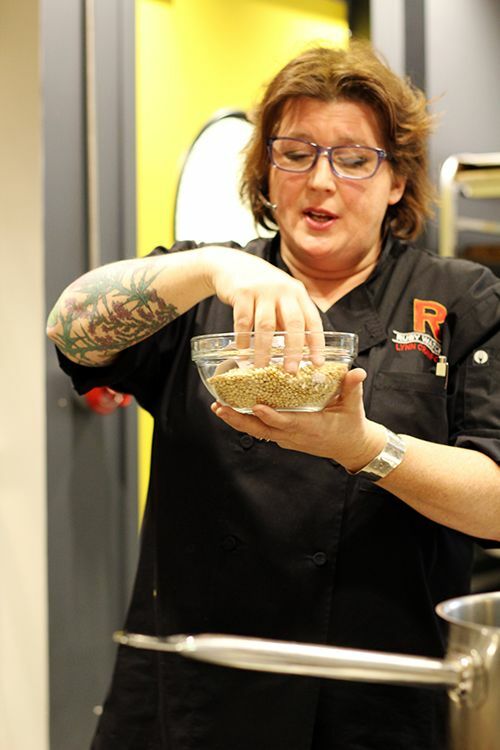 Since the launch of the Catelli Healthy Harvest Ancient Grains product in January of 2015, Chef Lynn has been promoting the product and even uses it at Ruby Watchco. 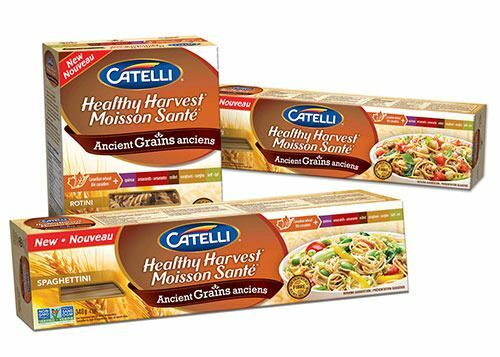 Catelli's Healthy Harvest Ancient Grains pasta is the first of it's kind. Being released only in Western Canada, the pasta combines 100% Canadian whole wheat with five different ancient grains: quinoa, teff, amaranth, millet and sorghum. The result of blending all these grains together is a great tasting product packed with wholesome nutrients and health benefits in each bite. I personally cook with quinoa on a regular basis, but some of these ancient grains are completely new to me. 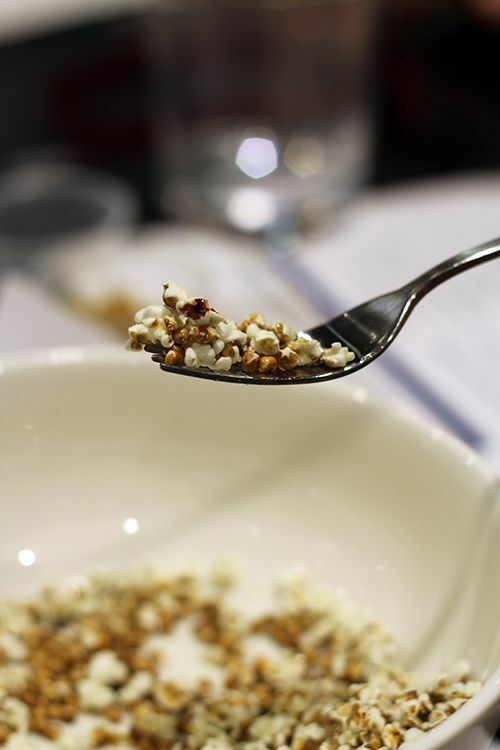 For example, I've never had sorghum, but now that I know it can be popped like popcorn, I'm totally going to make it and snack on it! I try to be health conscious and it's important for me to know that the food I am eating is nutritious. I was pretty impressed by the high protein and fibre content in just one serving of pasta. Whether you try the spaghettini, rotini or spaghetti, the health benefits are the same. Way to go, Catelli! The evening with Chef Lynn was so much fun. From coaching a participant to make pesto in record time, to mixing vinaigrette by shaking it to Taylor Swift's 'Shake It Off', Chef Lynn is hilarious and such a great host. 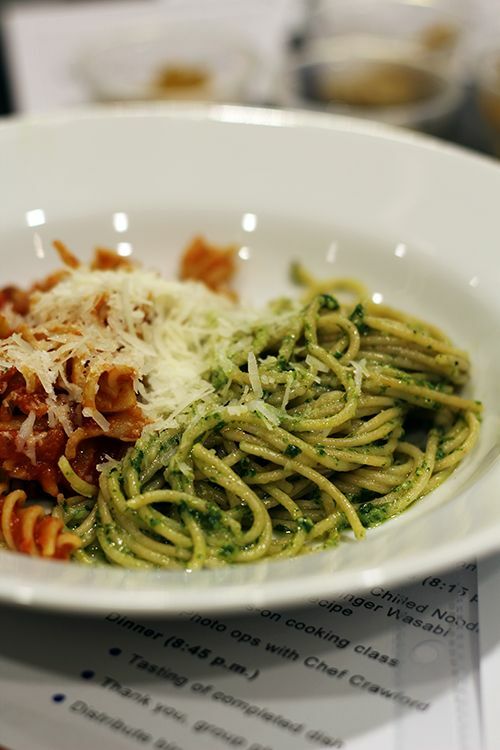 Using the Ancient Grains pasta, she cooked up rotini in her signature marinara sauce and spaghettini in pesto. Both pastas were delicious, and I almost couldn't tell that the pasta was whole wheat. There's a slight difference in texture, but otherwise it's great and I would recommend the pasta for the added health benefit. To end off the evening, Chef Lynn gave a demo on one of the recipes she developed for the Catelli Healthy Harvest Ancient Grains pasta - Chilled Noodle Salad with Ginger Wasabi Dressing. After the demo we split into groups to make the salad ourselves. FYI it's delicious, so make sure to make some for yourself. 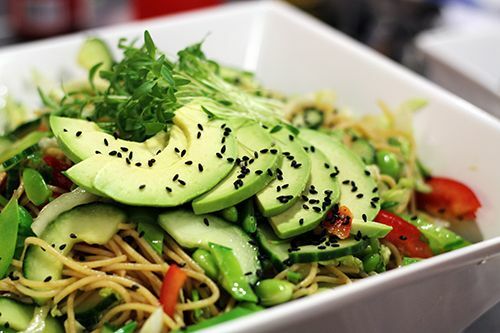 You can find the noodle salad recipe via Google, and you can find some of her other recipes for Catelli on the website here. Now since you didn't get to spend a fun night with Chef Lynn Crawford, I'm hoping I can make up for that by giving you a chance to win a year's supply of Catelli Healthy Harvest Ancient Grains Pasta! That's 60 boxes and endless possibilities for pasta dishes. See the details below! To enter, you must comment below and tell me what dish you would make with your ancient grains pasta. Please make sure you leave a valid email address in the giveaway widget as this is how I will be contacting you. This giveaway is open to anyone 18+ years of age in Canada. You have until April 6 to enter and the winner will be selected by random and be contacted via email. Good luck! It's rare, but every once in a while I have a meal and think "WOW, what did I just eat?!" because my tastebuds are blown away by the amazing dining experience. This very instance happened last week when I had the opportunity to participate in an underground dinner hosted by Chef Tony Krause of The Salt Room. Tucked in the corner on the upper floor of Edmonton's Mother's Market, Chef Tony Krause serves food to the weekend Market crowd (Friday-Sunday) and is now venturing into hosting underground dinners during the week when the market is closed to the public. 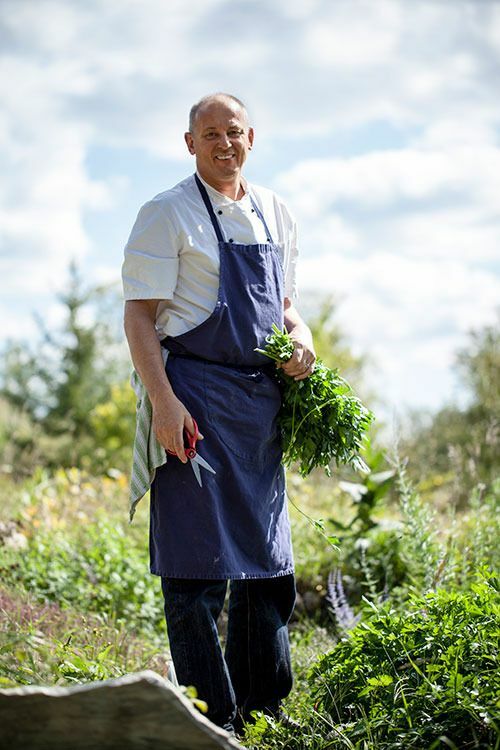 With a passion for foraged food, nose-to-tail dining, and housemade charcuterie, Krause (previously of The River House and Privada Wine & Tapas in St. Albert) is offering five course meals with non-alcoholic beverage pairings at $70-$100 per person, depending on ingredients. Dinner was to start promptly at 7PM, and I fully expected to be amongst many diners. To my surprise I was seated with 8 other individuals at a communal table. Much more intimate than expected, but the smaller setting allowed for inclusive conversation and a chance to get to know everyone. The dinner menu had expanded to include two extra courses, and all seven dishes focused on using local ingredients. Certain ingredients were foraged from the Edmonton and St. Albert forests while the remainder were sourced from the various vendors at Mothers Market. Dinner started off with an amuse bouche made with variations on potato, olive, and duck. 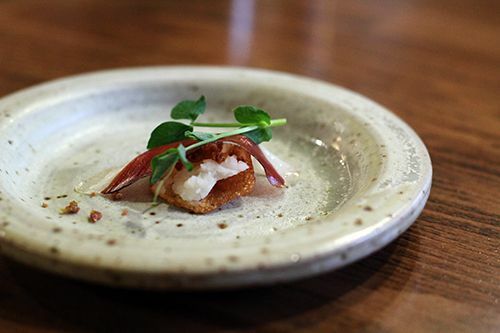 A potato chip was topped with smashed Russet potato, dehydrated olive dirt, yeast purée, a thin slice of duck prosciutto, and a pea tendril. The contrasting textures of the smooth mashed potato and crunchy chip went well with the salty cured prosciutto and fresh pea tendril. I couldn't quite taste the olive, but regardless, this small morsel of awesome had everyone at the table excited for the courses to come. The next course was a presentation of beautifully baked breads. On the plate sat rosemary focaccia, a potato bun, and a half portion of a pretzel bun. Served with a quenelle of whipped brown butter topped with bacon bits and Maldon sea salt, this course was deadly - we were all going to be full by the second course! The breads themselves were fantastic. All of them were soft and airy, but different in their own way in texture and flavour. 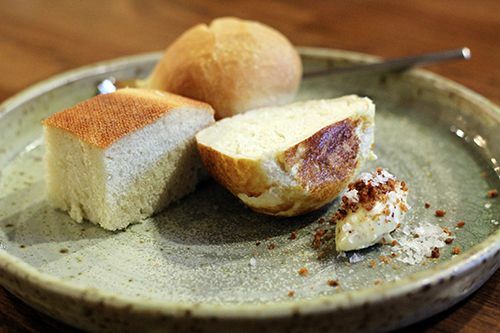 The butter had a wonderful aroma and enhanced the flavour of each bread. Lucky for us all, mason jars full of brown butter are available for sale at the market on the weekends for $7. Our third course was a play on shrimp cocktail, featuring langostine from Sgambaro's Seafoods, and beets two ways. The langostine was lightly grilled over charcoal and placed on a splash of pickled beet purée. 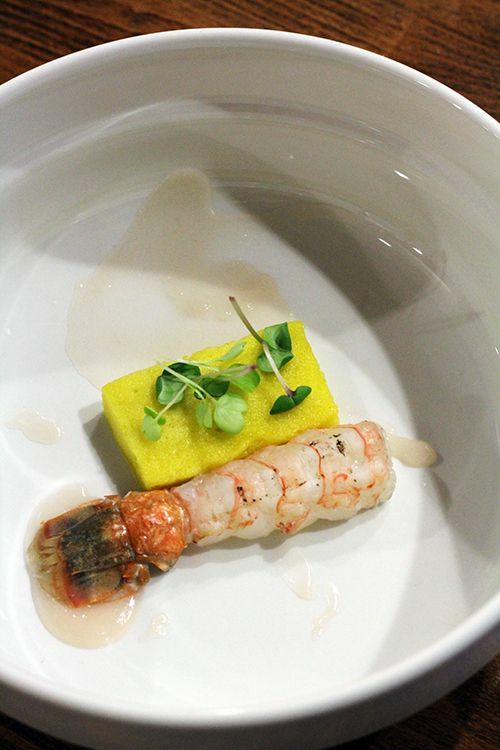 A yellow beet sponge accompanied the langostine and the entire dish was finished with a garnish of radish and daikon microgreens from Harvest Microgreens. The purée had a delightful tang, while the beet sponge had a dense foamy texture. Both flavours and textures combined well with the natural sweetness of the langostine, and I really enjoyed the different textures on the plate. The dish was also paired with a great housemade ginger ale! Next up was my favourite savoury dish of the evening, and it came as a shock to me when we were told what was on the plate: beef heart cooked to a medium rare and coated in mustard jus served with a play on a Lyonnaise salad. 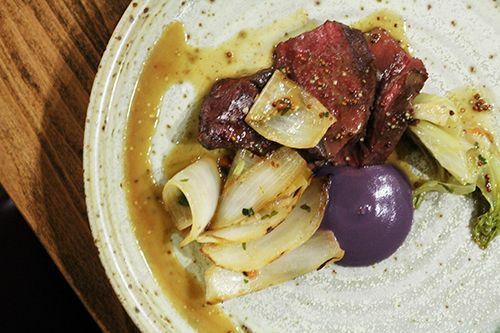 The tangy salad was made with charred onion and red leaf lettuce hearts, and the dish was accompanied by a dollop of purple carrot purée for some sweetness that we all cleaned off the plate. The heart was so incredibly moist and tender that I never would have known what cut of beef I was eating had I not been informed. 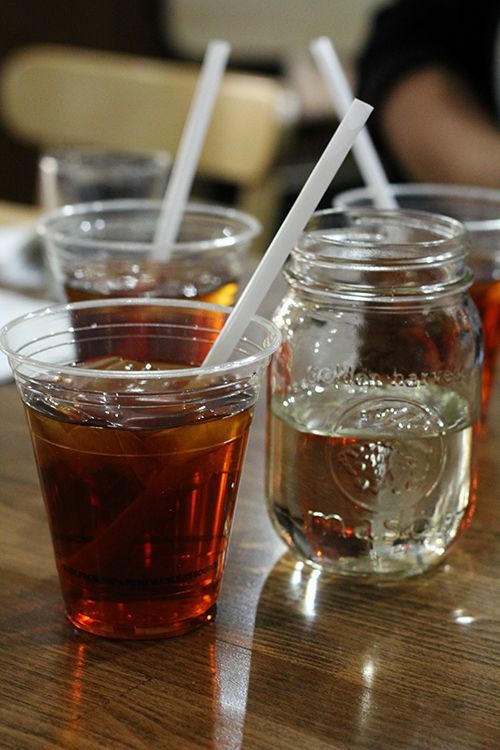 The dish was paired with a housemade iced tea which we adjusted to our own tastes with some simple syrup. Our fifth course of the night was a kale pasta with a generous serving of braised lamb neck and Sylvan Star's Old Grizzly Gouda. This dish combined some of my favourite things all into one: pasta, lamb, and old grizzly gouda. There could be no wrong. Chef Tony takes freshly pressed kale juice and mixes it into his pasta dough to give that fresh green colour. From there an extruder forms the zucca, which is pasta in the shape of a squash stem. 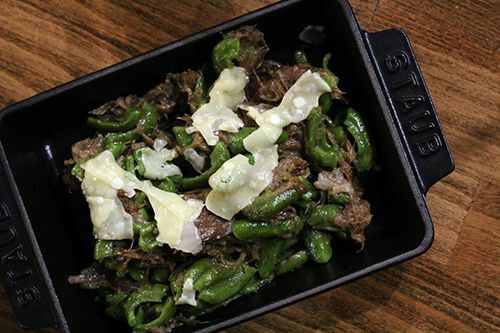 The fall apart braised lamb was moist and flavourful and the cheese made the dish rich and comforting. It was a little saltier than I prefer, but the Juniper Italian soda served on the side was perfect to mellow out the flavours. Oh, and I must mention - Chef Tony and his partner Chelsea made the soda with Juniper branches that they foraged in St. Albert. It was my favourite drink of the night, hands down! Dessert that evening was stunning. 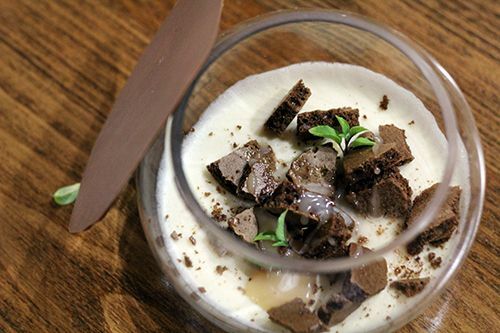 Mimicking a terrarium, the glass vase was filled with a blood orange bavarois topped with dehydrated chocolate mousse chunks, drizzled with a light caramel sauce and finished with cinnamon basil. When smashed, the chocolate lid released the fragrant smell of orange blossom. It was such a decadent dessert with hints of citrus, and it really showcased Chef Tony's artistic abilities and wide culinary skillset. We were provided with a box of petit fours to take home, but I have to admit that they did not make it into my house. I ate them on the drive home! We received a popcorn caramel, smoked alder chanterelle chocolate truffle, and a sour cherry gummy, and none of them disappointed. The caramel was rich and gooey, the gummy tart was sweet, while the truffle was rich and decadent. This was hands down one of the best meals I have had in a long time, and I'm already so excited for the next dinner. 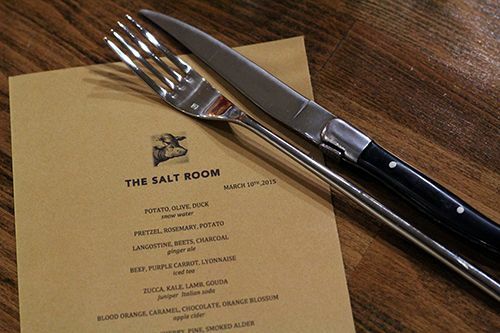 There are plans in the near future to turn The Salt Room into a full-fledged restaurant, but for now you can visit Chef Tony at the Mother's Market on weekends to sample his menu items and eye up his housemade charcuterie. The next underground dinners are planned for March 31/April 1, but unfortunately they are already sold out. Keep an eye out and follow on Twitter for an announcement for the next dinner - be sure to be quick to submit your reservation request! This past Thursday I had the pleasure of attending the 7th annual Northern Alberta Institute of Technology (NAIT) Hokanson Chef in Residence Luncheon. Each year NAIT's School of Hospitality and Culinary Arts treats students with the rare opportunity to learn from some of the best chefs in North America. The past years have featured Susur Lee, Lynn Crawford, Rob Feenie, Massimo Capra, David Adjey, and Chris Cosentino. 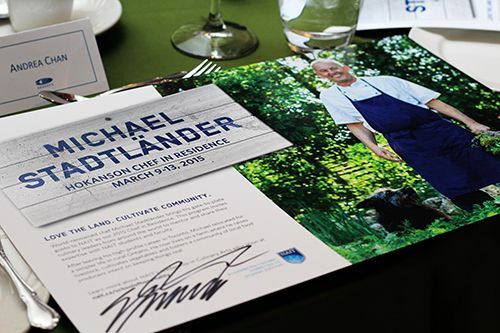 This year the program welcomed Chef Michael Statdländer into the kitchen. I'll admit that I didn't know too much about Statdländer, but after some research I was pretty excited to have the opportunity to eat one of his meals. Prior to the start of the meal the room was abuzz with guests waiting to see what lunch had in store. The kitchen was busy with culinary arts students putting the final touches on plates, with Stadtländer's encouragement. Our meal started off with assorted breads, some of which I never thought I would ever try. 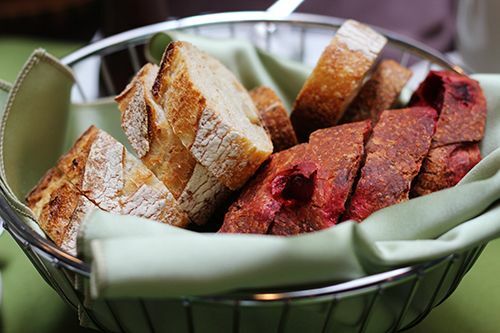 The basket was filled with beet bread, mushroom bread, and sourdough. I loved the pink colouring of the loaf with chunks of soft, sweet beets. 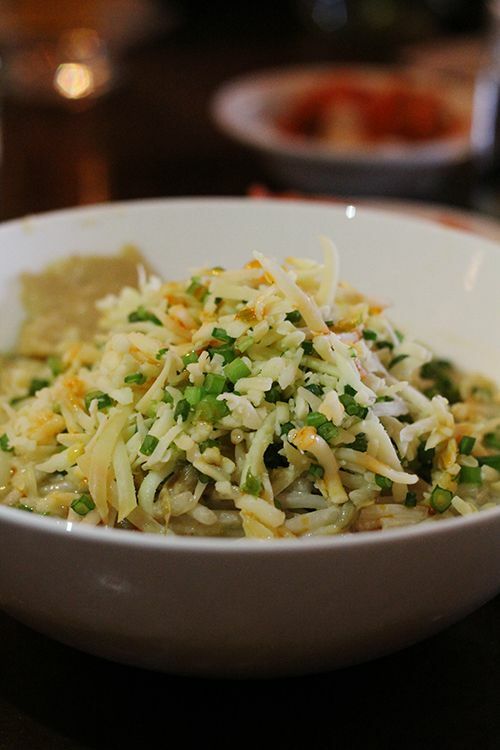 Having some root vegetables in there makes you a little less guilty about all the carbs you're consuming! 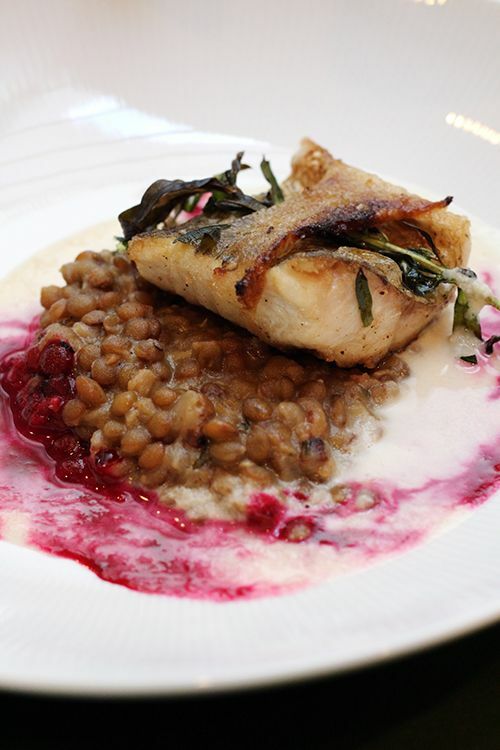 Our first course was a Panfried Alberta Whitefish cooked with in house smoked pork back fat, served with creamed lentils and red beet horseradish sauce. Chef Statdländer based this dish off one of his at Haisai, where fish is wrapped in speck then smoked. The lentils were cooked and flavoured using thyme, bay leaves, and dijon, making them tender and flavourful. In what would otherwise be a pretty dull dish, I loved the beet sauce giving the plate both colour and vibrancy. 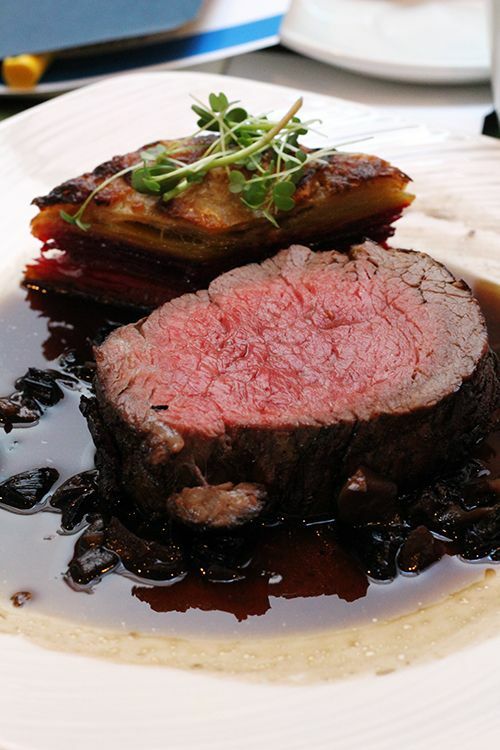 Next up was a Rare Rosemary Roasted Beef Tenderloin with a root vegetable cake and wild Canadian mushroom jus. Although the beef wasn't cooked to a perfect rare, it was so tender and juicy. The beef was seared quickly in sunflower oil and was honestly perfect in and of itself. The root vegetable cake was layered with a creamy onion thyme sauce and finished with a three year old cheddar. 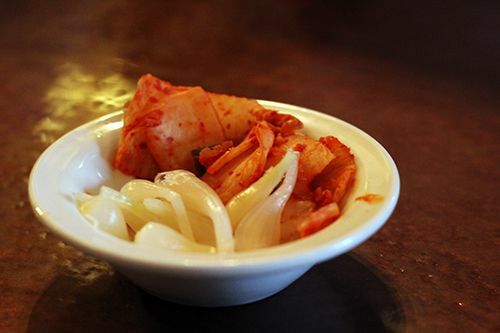 Although there were additional flavourful components, I could still taste the natural sweetness of the vegetables. The dish was delicious! To round off the meal, Chef Statdländer served us one of his favourite desserts: Vienna Apple Strudel with Chantilly Cream. He had joked that he wasn't so sure about how this dish would turn out since the dough can be incredibly difficult to stretch out as thin as it should be, but he was quite impressed with the students attention to detail and the finished product. 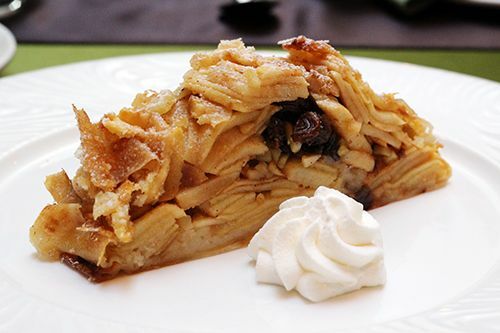 The dessert was made with apples grown locally in North Edmonton and cinnamon sugar almonds. The naturally sweet apples made for a lightly sweet dessert and a perfect end to our three course luncheon. Although most people do not get the opportunity to attend the Hokanson Chef in Residence luncheon, knowing that the culinary arts students take the knowledge from these renowned chefs and go on to cook amazing food in some of the best kitchens here in the city is awesome. Edmonton's food scene is growing and I can't wait to see how it develops over the next few years. A huge thank you to NAIT for inviting me to the luncheon this year - I can't wait to see who the chef in residence will be in 2016! 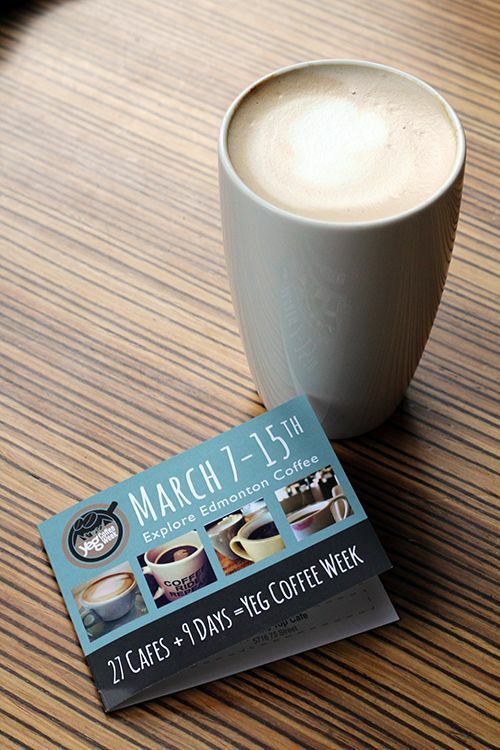 It's the inaugural YEG Coffee Week, or what I am now calling the week where Edmonton gets buzzed on caffeine! 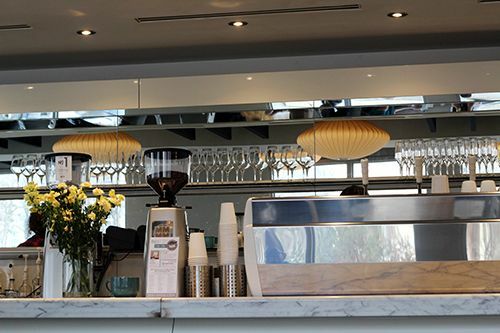 From March 7-15th, 27 different cafes across the city are hosting different events and letting the quality of locally-roasted coffee beans speak for themselves. Throughout my university years I was never a real coffee drinker. Sure, I had a little caffeine here and there to get me through classes and writing those papers into the early morning, but I never really loved it. Fast forward to this new career where I work 12 hour days and nights, and coffee is slowly becoming my new best friend. To kick off coffee week my boyfriend and I stopped by Leva for coffee and breakfast. What I particularly love about Leva is that it isn't on any major roads, making it a quiet place to visit during the day. It's tucked away in the heart of Garneau and really is a great spot to grab a bite to eat and get some work done! The breakfast menu at Leva has a variety of offerings ranging from yogurt and fruit salads to heavier items like breakfast sandwiches and pizzas. There's a little something for every appetite, and it's definitely a challenge to resist the tempting display case full of freshly baked pastries. My boyfriend opted for the Smashed Avocado Open Faced Sandwich ($13.25) served with a potato hash. 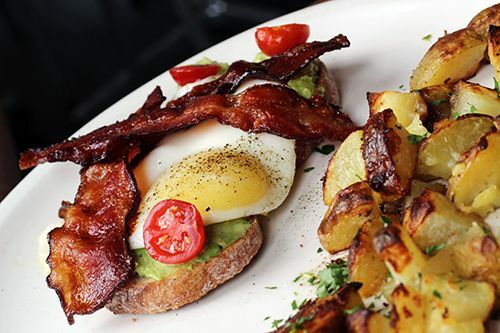 Avocado is mashed and spread over artisanal toast and topped with cherry tomatoes, maple bacon, and an over easy egg. The crisp bacon was the perfect combination of salty and sweet, and the runny yolk brought every ingredient together. The potatoes were soft with a crisp golden exterior, and with a bit more seasoning they would have been perfect. 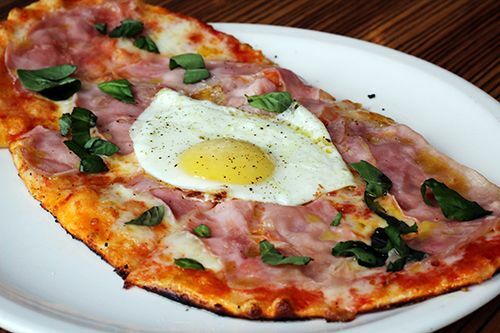 Gluttony began early in the day for me as I chose to go with the Breakfast Prosciutto Cotto Pizza ($15). This was actually a margherita pizza topped with prosciutto, finished with an over easy egg and fresh basil. If there's an egg, it's breakfast! The crust on my pizza was nice and thin, whereas the underside was crisp and browned and the cornicone (outer ring of the pizza crust!) was crunchy and airy. Due to the heavy nature of the garlicky tomato sauce, prosciutto, and cheese, the crust itself didn't hold together well enough to be picked up, so I enjoyed my pizza with a fork and knife. It was a massive portion for breakfast, but I worked my way through it since it was so tasty. All meals have to end with something sweet, and when you're at a cafe with freshly baked pastries the rule definitely applies. I would have loved to try one of each item behind the display case but ultimately went with the beautiful lemon meringue tart and chocolate croissant. 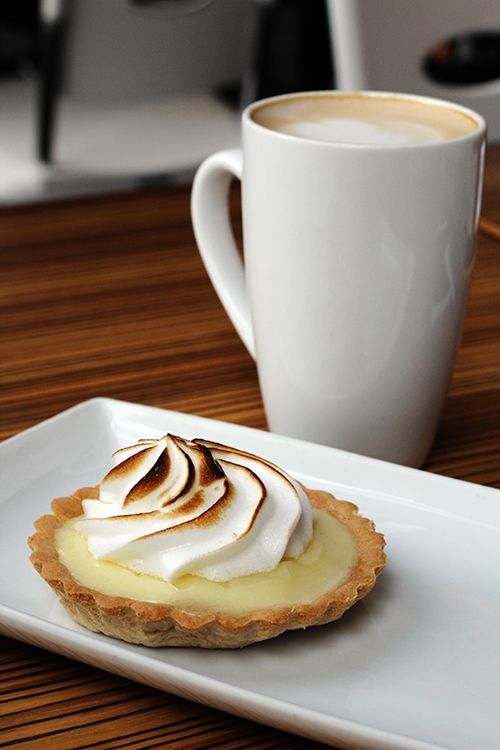 Leva's lemon tart is delightfully tangy, giving your lips a bit of a pucker, but is balanced out with just the right amount of sugar. The cream is velvety smooth and the tart crust is soft and flaky. If you're a citrus fan you definitely have to give the tart a try. 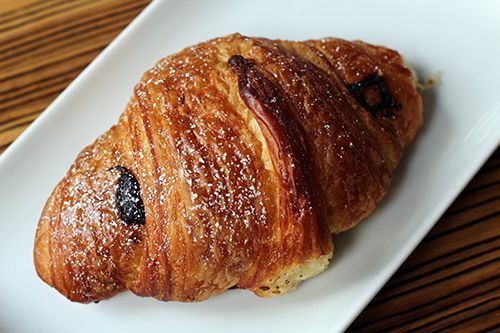 Now if you're more of a chocolate lover, the chocolate croissant will do you no wrong. Layers of flaky, buttery croissant dough are wrapped around a stick of semisweet chocolate and baked to a point where the crust has the right crunch and airy texture. It is so, so good. 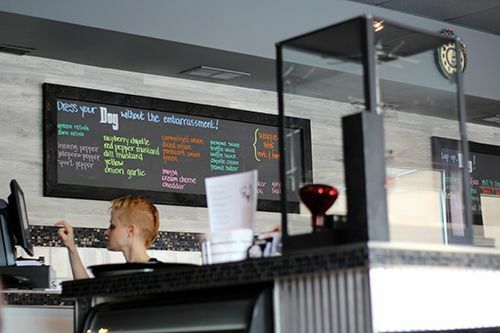 Great coffee, in-house pastries, a seasonal menu, and the use of local ingredients are just some of the things that make Leva one of the great cafes in Edmonton. With 27 different cafes participating in YEG Coffee Week, I urge you to go check out at least one you've never been to before. 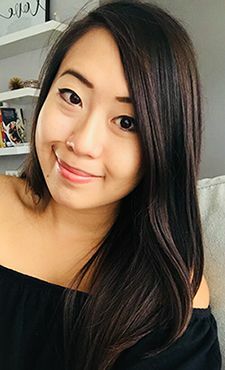 And even if you don't like coffee, YEG coffee week is meant to use coffee as a means of connecting with others and building community. Get yourself to a great cafe, meet up with a friend and enjoy your favourite non-coffee beverage! 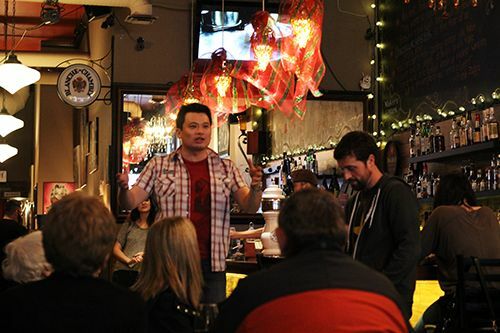 For more info on YEG Coffee Week, visit the website here. Growing up, my mom used Aveeno products on my skin exclusively. She swore by it. 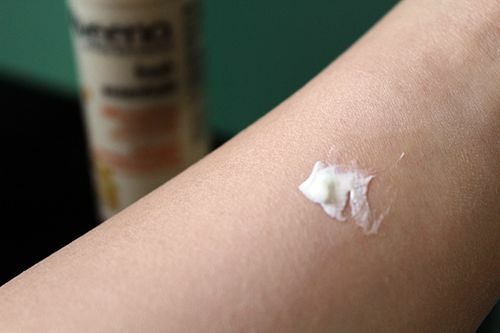 I never had any common childhood skin conditions like rashes or eczema, and she attributes it to the daily use of Aveeno's oatmeal based product line. 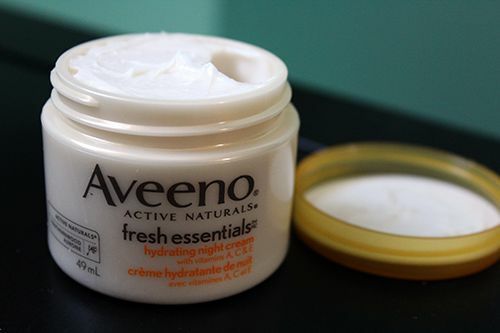 Throughout my elementary years, I remember using Aveeno on the daily, slathering it over my cheeks, hands and arms after every shower and bath. I always wanted to try out my mom's 'cool' products with beautiful packaging (she used Shesheido for herself), and after denying me multiple times, she took one of her gold & white Shesheido containers and put the Aveeno moisturizer in there for me to use. I was a happy camper with my so-called 'grown up' cream. Junior high was a time in makeup experimentation and my parents allowing me to go to the mall independently. I said goodbye to Aveeno and started trying out higher-end makeup and skincare products, and to this day I haven't turned back. So when I was asked to give the new Aveeno Fresh Essentials product line a try, it was a nostalgic trip down memory lane for me. The line of Fresh Essential products boasts to replenish moisture to stressed skin by using Southernwood extract and vitamins A, C and E. There are many causes of stress in our lives, from poor diets and sun exposure, to a lack of sleep and a busy lifestyle. 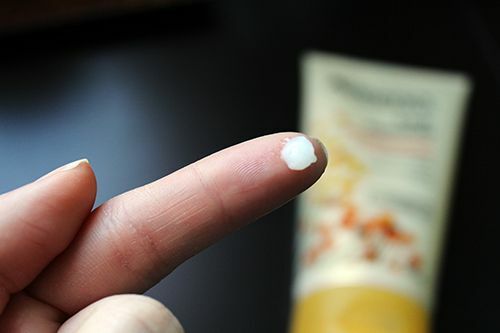 These tiny stressors definitely build up and cause damage to your beautiful skin, making it look dehydrated and dull. This is what Aveeno's products are designed to combat. The Fresh Essentials product lineup includes a nourishing moisturizer with SPF 30, a hydrating night cream and an exfoliating scrub. I tested out the products for a month and generally enjoyed the results, so lets take some time to talk about each one. The Daily Exfoliating Scrub (photo above) promises to reveal fresher-looking, smoother skin with each use. Luffa and coconut pulp are two natural ingredients that make up the scrub, and it really feels like a micro-exfoliant when used on the face. The tiny particles lightly polish away at the skin to make it feel incredibly smooth afterwards. I'm not a daily exfoliating type of person, so I used this twice a week and found my skin to be less prone to dry spots. Aveeno recommends using the Nourishing Moisturizer with SPF 30 to follow your daily facial scrub. The formula is quite lightweight and quickly absorbs into the skin, giving a soft, smooth result. The product didn't make my skin overly oily, and I love that the product wasn't heavy given the higher SPF rating. The last product in this range is the Hydrating Night Cream. This cream is designed to restore moisture to the skin while you're sleeping so that you wake up with skin that is refreshed and renewed. I actually quite enjoyed this night cream because like the daytime moisturizer, it was moisturizing without being heavy. I found that it was easy to spread, making a small amount of product go a long way. 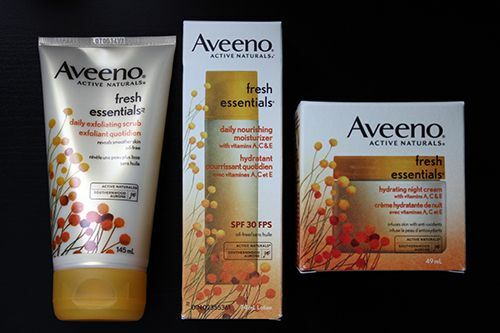 The Aveeno Fresh Essentials product line worked really well for me, but the one thing I am not keen about is the scent. The scent is a mix between florals and fresh laundry. While I didn't mind it, I find the scent is very strong and overpowering. With each application of the moisturizer and cream, I found the scent tended to linger and took quite some time to dissipate from my skin. Given that I work in a scent-free environment, I couldn't continue using the products before heading to work. It is a pleasant scent, but if you're adverse to anything strong smells you may want to stay away from this product line. It's really unfortunate since the products work really well! Otherwise if you're still interested, the Aveeno Fresh Essentials line can be found at your local drugstore. 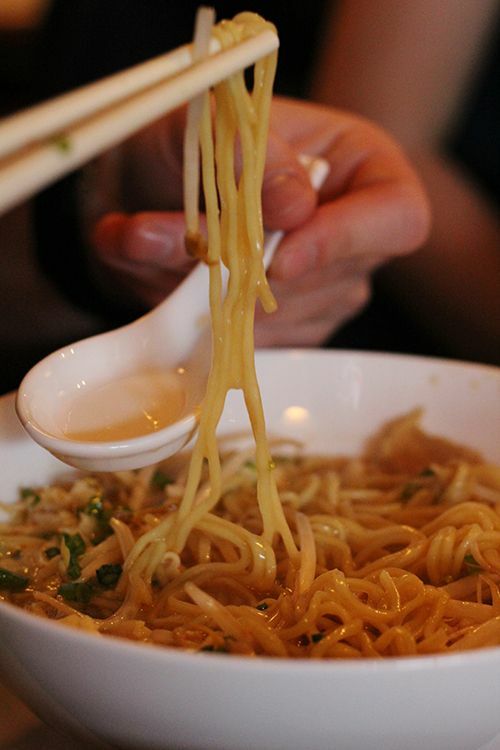 If you know me, you know that I love noodle soups. There's no denying it. But once in a while I like to change things up, and I can get pretty strong cravings for a good sandwich. A new sandwich shop opened up in Edmonton last week and my taste buds were itching to check it out! 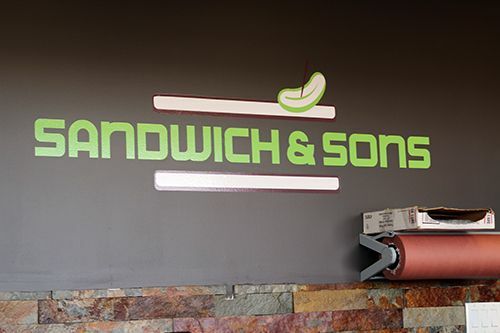 Sandwich & Sons is located just north of the Yellowhead on 156 Street in an industrial part of Edmonton. It's a new deli-style concept opened by Chef Alex Sneazwell (formerly of The Manor, Von's, El Cortez) offering soups and sandwiches during the day from Monday to Friday. The menu itself is simple and is written in chalk on the wall. 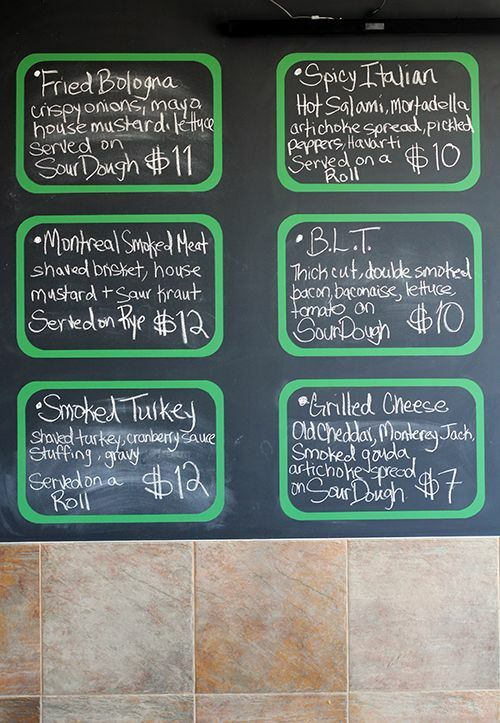 Classic sandwich combinations are put together with an emphasis on using local ingredients and housemade fixins. Each sandwich includes a side of housemade chips and a pickle, and the price is inclusive of tax. Daily soup and drinks are available for $3 each, and the housemade mustard and pickles are also available for purchase to take home. I stopped by for a quick lunch today with my boyfriend, and of all the choices on the menu the top contender for us was the Montreal Smoked Meat sandwich ($12). Shaved brisket, house mustard and sauerkraut are piled high between the two warm slices of rye, there's no shortage of meat here! The brisket comes from local producer Sangudo Meats, and this meat is fantastic. The brisket is sous vide for 24 hours then smoked with pecan wood. The resulting brisket is tender, flavourful, and not overly smoky. Grainy mustard is one of my favourite things in sandwiches, and everything combined with lightly pickled sauerkraut made this sandwich a hit. Our other top choice was the Spicy Italian sandwich ($10). 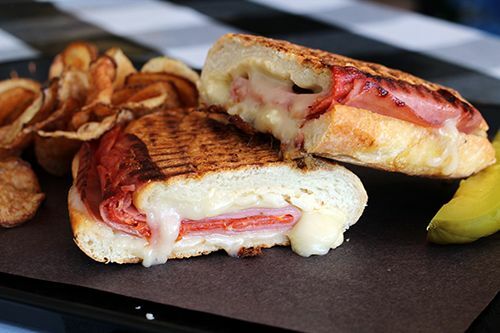 Hot salami, mortadella, artichoke spread, pickled peppers and havarti are placed inside of a roll and squished inside a panini press. The resulting sandwich is crispy, has a kick of heat and is oozing with melted cheese. 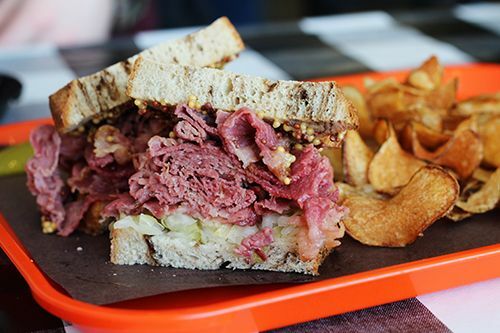 The sandwich doesn't have the grandeur of the Smoked Meat, but it's a pretty solid sandwich on its own. I did find it to be a bit greasy, but that's just the nature of the ingredients used. Other than the sandwiches, the chips on the side weren't too greasy and just lightly salted for a bit of flavour. I was a little sad that Sandwich & Sons didn't make dill pickles to accompany their sandwiches, but the tangy pickles still had a bit of bite that I enjoyed. In conversation with Chef Sneazwell, he mentioned that the smoked brisket, turkey, bologna and bacon are all supplied by Sangudo Meats. It's great to see a small sandwich shop supporting local in the ways that they can! From social media it looks like Foie Friday is going to be a thing, so you foie gras fans should flock there to celebrate the end of this week with a foie gras banh mi. Sandwich & Sons is open Monday-Friday, and catering is available too. Stop by and give them a try if you're in the area - the sandwiches are solid.